For the debtor the consequences of non payments and defaults on loans and other forms of credit can last for years. Not only can bad credit references be applied but finding normal interest rates on loans will be almost impossible to achieve. A default on a loan simply means that the borrower has failed to make repayments when they are due. It could also mean that the borrower has broken the terms and conditions of the loan or failed to comply with the company's loan requirements. 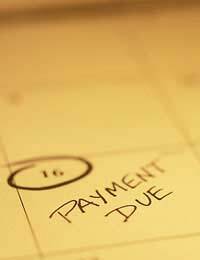 Non payments can also mean missed payments or a failure to complete the full loan term by missing a number of payments. Fees and charges will be applied to the loan. The debt is passed to a debt collector. Bailiffs can be brought in to repossess goods on certain debts if actioned by the court. Bad credit references can be applied. High interest rates will be applied to future loans if any loans are offered. Court action can be taken. Possible repossession of home used as security. One of the most likely consequences of non payments and defaults on loans will be a bad credit reference for the borrower. Bad credit references can follow the borrower around for years; most credit references will state bad debts for up to six years. Lenders will look at a borrower's credit reference when they are considering whether or not to give credit. In a lender's eyes having a bad credit record will certainly not be looked on favourably. It can block a lender from obtaining loans, credit cards and forms of higher purchase agreements. It can also stop something as simply as obtaining a mobile phone contract or renting property. In today's society having a bad credit record is seen in some quarters as financial suicide. Another consequence of non payments and defaults on loans is that debt collection agencies will be called in. The collection agencies will use all of their powers, however limited, to recover the debt. They will also apply their own fees to the debt and, although against the law, will try any number of intimidation tactics to recover the debt. Borrowers should always try to negotiate a repayment schedule if debt problems have reached this point. Court action is perhaps one of the most serious consequences of non payments and defaults on loans. Courts have far greater powers when it comes to recovering debts than debt collectors. They can enforce repayment of debts, garnish wages, apply County Court Judgements, and may even apply bankruptcy in some cases. Another serious consequence for non payers is repossession of the home if it has been used as security on a loan. This can be a long and drawn out process and there should be other alternatives set in place before this occurs. Judges would rather set up an alternative payment scheme than apply a home repossession order. It is never too late to renegotiate a repayment scheme with lenders. This option is usually open up until the court action process. Lenders should always be open to renegotiation options such as longer loan lengths, lowering repayments or freezing interest payments. As long as the debtor has offered to make some form of payment the matter should not usually reach the court action stage. The consequences of non payment and defaults on loans are serious enough to make a significant difference to the borrower's life. One or two missed payments may be all that it takes to begin a bad credit history. Borrowers who know they will miss payments should always contact their lenders and make them aware of their situation. The missed payments may be made up at a later point without the need for bad credit references.